This book provides a careful explanation of the basic areas of electronics and computer architecture, along with lots of examples, to demonstrate the interface, sensor design, programming and microcontroller peripheral setup necessary for embedded systems development. With no need for mechanical knowledge of robots, the book starts by demonstrating how to modify a simple radio-controlled car to create a basic robot. The fundamental electronics of the MSP430 are described, along with programming details in both C and assembly language, and full explanations of ports, timing, and data acquisition. Further chapters cover inexpensive ways to perform circuit simulation and prototyping. Is a DC motor also a DC generator? Why is it called logic? What is a central processing unit and how does it work? What does an MSP430 instruction look like? How does the microcontroller talk to the peripherals? Is there more than one type of MSP430 and what are the differences? What is the MSP430 launchpad? 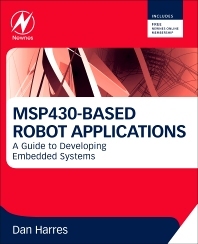 Which MSP430 types does this book focus on? Dan Harres has 36 years of engineering experience with McDonnell Douglas Corp., Boeing Company, and ITT Electro-Optics Corp., and is the inventor of 29 US patents and patents pending. He has authored around 30 technical magazine articles and conference papers, and chaired the IEEE Avionics, Fiber Optics, and Photonics Conference in 2009-10. His principal areas of work are analog circuit design, microcontroller applications, and fiber optics system design. Technical Fellow, Boeing Company, Belleville, IL, USA.